Choose from our wide selection of hotels located in and around Boston. Whether you’re looking for budget hotels, resorts, or luxury hotels, you’ll find the best accommodations at the best prices. Stop wasting time and make your reservations online now! Nestled on the city's historic scenic waterfront, Boston Harbor Hotel's internationally acclaimed architecture welcomes travellers to Boston. The magnificent 80-foot arch, Italian marble and a collection of art bridging three centuries of New England history greet you upon arrival. Every luxury is offered, from our plush guest rooms with breathtaking harbor or city skyline views, to the attentive service only a hotel as intimate as this can afford. As you relax with a Martini Jo at Boston's best Brasserie, or sip a Colonnade Cooler by the city's only rooftop pool, you can congratulate yourself. You have discovered one of Boston's finest hotels. 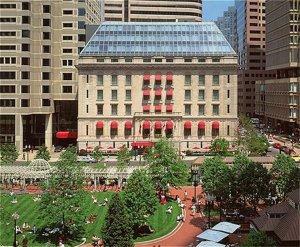 Located in historic Back Bay, The Colonnade Hotel is a luxury hotel styled in the European tradition. Fifteen Beacon is a refined landmark hotel in a 1903 beaux arts building that juxtaposes cutting-edge technology with extraordinary Jeffersonian styling. Situated atop historic Beacon Hill, the hotel is central to the financial district, the State House, and exclusive Newbury Street. This striking cosmopolitan hotel offers a rarefied residential impression. A cozy home-like atmosphere meeting the expectations of demanding guests offering a Business Center with meeting areas and high-tech equipment as well as the largest presidential suite in New England. Located in the heart of the city, within walking distance from historic freedom trail, theater district, few blocks from the expressways and only a few minutes away from the Logan International Airport. Langham Boston is Boston's premier European-style hotel providing impeccable service in a historical setting. Formerly the Federal Reserve Bank of Boston, the hotel is listed on the National Register of Historic Places. Overlooking the gardens of Post Office Square, the hotel is just steps from scenic Boston Harbor, The Freedom Trail, Julien and Café Fleuri, Faneuil Hall and the shopping district -- making it an ideal destination for discerning travelers. 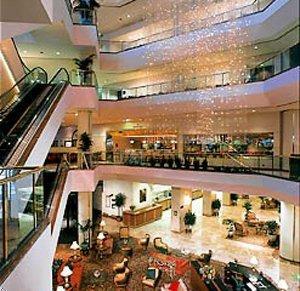 The Boston Marriott Copley Place is Boston's most complete convention hotel in the heart of the Back Bay. Ideally located in a dual indoor shopping mall complex featuring over two hundred shops and restaurants, the hotel is just one quarter mile from Hynes Convention Center. Many cultural and historic sites of Boston are nearby with the Back Bay subway station on the orange line a short walk from the hotel. 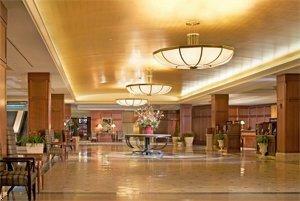 The Boston Marriott Long Wharf offers a central and premier location for both business and leisure travelers. Situated on downtown Boston's historic waterfront, this full-service hotel is adjacent to the New England Aquarium and one block from Faneuil Hall, Quincy Market and the financial district. The blue line State/Aquarium stop on the Boston subway system is three blocks from the hotel providing service throughout the metropolitan area including Logan International Airport just two stops away. 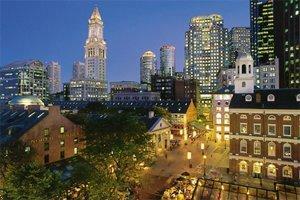 Located in the heart of Faneuil Hall Marketplace and Bostons Financial District. The Millennium Bostonian Hotel offers every amenity imaginable in this intimate and highly personalized luxury hotel. Some of the 201 guest rooms feature working fireplaces and French doors opening onto quaint balconies. The Millennium Bostonian Hotel, Boston is an intimate and highly personalized luxury hotel offering guests a high-quality residential atmosphere. As guests pass through the sculpted bronze doors of this four star luxury hotel, they will be enveloped by the timeless beauty that has made the Omni Parker House a Boston landmark since 1855. Admire the oak-paneled walls and breathtaking crystal chandeliers that grace the hotel lobby. City's best location for business, shopping, theater, sporting and cultural events. Hotel offers oversized guest rooms, heated indoor pool, restaurant, health facility, live theater and concierge services, on site parking available for a fee, parking attached to hotel. Seaport Hotel is located in the heart of the Boston's Seaport District overlooking Boston Harbor. Just minutes from Logan International Airport, Boston's financial district and Back Bay. Nestled in charming and historic Back Bay, the Sheraton Boston Hotel is ideally situated for business, weekend getaways, or a vacation in one of America's most historic and dynamic cities. Four miles from Boston's Logan Airport, we are close to the Financial District, Downtown Crossing, the scenic Charles River, many of Boston's favorite shops, restaurants, and museums, and only one block from famous Newbury Street. In the heart of historic Back Bay stands an equally legendary landmark. Built in 1927, the Boston Park Plaza Hotel& Towers is a member of Historic Hotels of America, and recipient of the Successful Meeting Pinnacle Award for delivering excellence in meetings. With an unmatched location, we are adjacent to the Public Garden with its Swan Boats and the chic boutiques, art galleries and restaurants of the world-famous Newbury Street. This exquisite suite hotel, built in 1925, is one of the finest addresses in Boston. 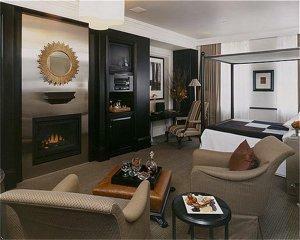 Situated amidst the city's cultural treasures, The Eliot Suite Hotel reflects the history, charm and warmth of Boston. Since its gala opening in 1912, The Fairmont Copley Plaza Boston has stood as a landmark and symbol of Boston's rich tradition of culture, history, elegance, and hospitality. Constructed on the original site of The Museum of Fine Arts, the "Grand Dame" of Boston was designed by Henry Janeway Hardenbergh. In historic downtown Boston, The Onyx Hotel is a gem of a boutique hotel, offering exceptional accommodations a stone's throw from TD Banknorth Garden, Faneuil Hall and North Station. Not much farther from our luxury hotel, you'll find the new and old city halls, state buildings and courthouses, Bunker Hill and the Tip O'Neill Building. Welcoming travelers since 1927, this Boston landmark is renowned for unmatched personal service in elegant surroundings. Located downtown at the corner of Arlington and Newbury Streets, the hotel overlooks Boston Common and the Public Garden and is surrounded by the city's most exclusive shops, galleries and museums with the business and theatre districts just minutes away. A commanding presence on the Boston skyline, The Ritz-Carlton Boston Common displays an exciting sense of innovation and reflects the modern-day core of New England's most forward looking city. Although it overlooks the oldest public park in the United States, Boston Common, this premier destination is the height of contemporary elegance. The Westin Copley Place, Boston is an idyllic urban retreat for travelers, set in the center of one of historic Boston's finest neighborhoods, Back Bay. The hotel features amenities such as Westin's exclusive 10-layer Heavenly Bed®, the WestinWORKOUT® Powered by Reebok Gym with indoor pool, shopping in the retail gallery at Copley Place, skywalk access to more than 100 shops at Copley Place and the Prudential Center, as well as the newly-opened Grettacole Spa, located adjacent to the hotel lobby.